Once you’ve ventured into the frozen foods aisle, it’s easy to think there’s no hope for a nutritious meal. Not so! A good-quality frozen meal or burrito can be made even better with some quick additions. Start with a product containing whole-food ingredients that you can pronounce, and with no trans fats. We recommend brands such as Amy’s Kitchen or Kashi, which make great-tasting and healthy all-natural frozen foods. Try to find a product with at least 15 grams of protein. Remove plastic wrap from burrito. Wrap burrito loosely in paper towel, place in microwave, and heat for 2–2½ minutes or until hot. 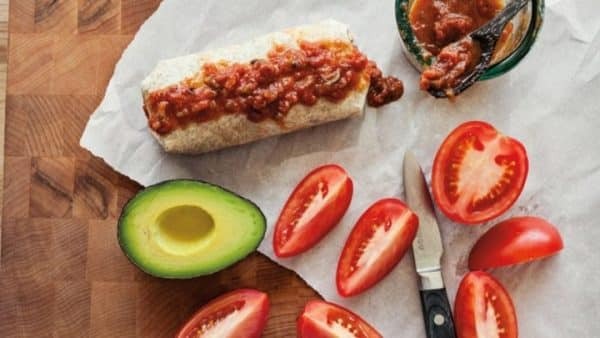 When burrito is heated through, transfer it to the plate and add tomatoes, avocado, and salsa. If your favorite burrito is short on protein, consider adding a hard-boiled egg, canned tuna, or cottage cheese as a side to bump up the protein.